Why Am I Losing My Balance Lately? 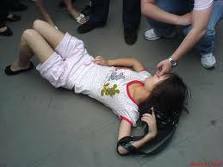 Vomiting and Fainting After Eating- A Special Risk for Vegans? third of us will have at least one in our life. Fainting or blacking out is responsible for 3 percent of U.S.
emergency room visits and 6 percent of hospital visits. and you "pass out" for a few seconds or minutes. dangerous if you’re driving a car. pressure, lack of blood flow to the brain, and fainting. study led by researchers from Harvard Medical School. lack of red blood cells to deliver oxygen to the brain. of the vein that returns blood to the heart. Do Heart Problems Cause Fainting and Blackouts? above your heart level on a pillow or blankets if you can. sitting down until the shaky feeling passes. consume to avoid dehydration and drink plenty of water. stabilize your blood pressure and you can faint. react, and take your time standing up. skip meals and keep your diet healthy. not just your head, as you look round. Have you ever fainted or backed out?